My first impression is that of a ship built expressly to purpose. 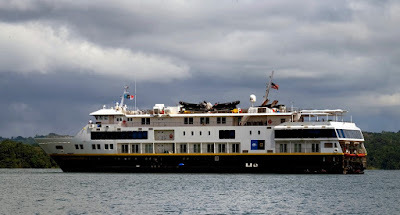 Lindblad's 50 years of expedition cruising has certainly provided plenty of insight into what's needed in an expedition ship. NG Quest is unpretentious and sturdy, even utilitarian in design and appearance. Forget gleaming, mirrored salons, chandeliers and abstract canvas art. Instead we have a relaxing and versatile lounge designed for the dual purpose of lectures and AV screenings as well as refreshments, bar and library. Walls throughout are decorated with giant National Geographic images of stunning wildlife and vistas. The 50 twin cabins are easily spacious enough for two and come in five categories across three decks, one of which includes private balconies. There are no TVs or minibars, but every category has a writing desk and ample storage. Help yourself beverages, tea, coffee and snacks are always available in the lounge. Dining is in the single-sitting, bistro-style area at the stern (just below the sundeck) and serves both buffet and plated menus depending on the occasion. Food is healthy, fresh and nutritious served in modest portions. Lots of fruits and vegetables, baked and grilled lean meats with plenty of colour in the salad bar. Sorry, but I haven't found the all-you-can-eat pizza bar and hamburger stand yet – and I hope I don't. 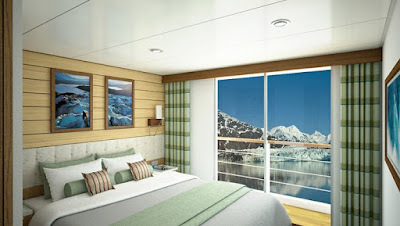 Great effort has gone into making this ship comfortable and practical for expedition itineraries. The transom or 'fantail' is located at the stern just above the water line and makes for hassle-free access to the Zodiacs, something many ships in today's global fleet still have trouble with. Also aboard are double and single kayaks, stand-up paddle boards and snorkelling kit for all. At time of writing, there is no provision for scuba diving, but I will keep asking. For healthy types there is a small gym and LEXspa treatment salon. A small 'Global Gallery' boutique/gift shop also stocks quality clothing and souvenirs. Lindblad Expeditions-National Geographic have always taken seriously the concept of 'low impact' travel. It pleases me to see every opportunity to minimise waste has been taken. 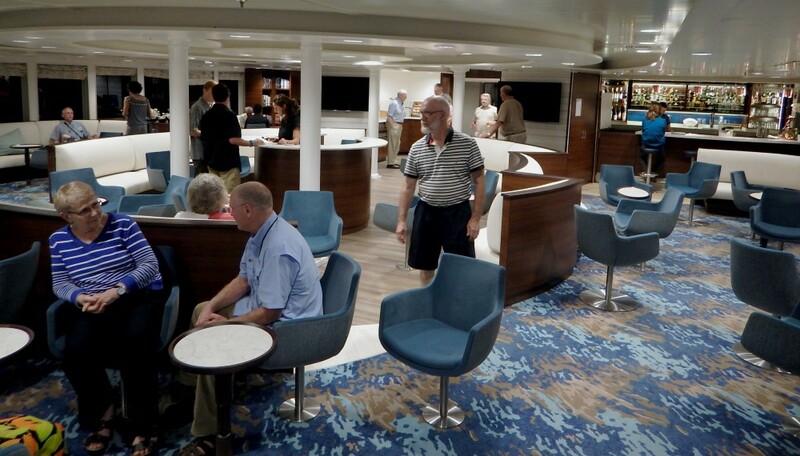 Obvious things many cruise lines only pay lip service to like refillable bathroom gels, no drinking straws and tough stainless water bottles filled (and refilled) from double-filtered taps and very minimal use of plastics. Hand-wash and sanitisation stations are in all public spaces. 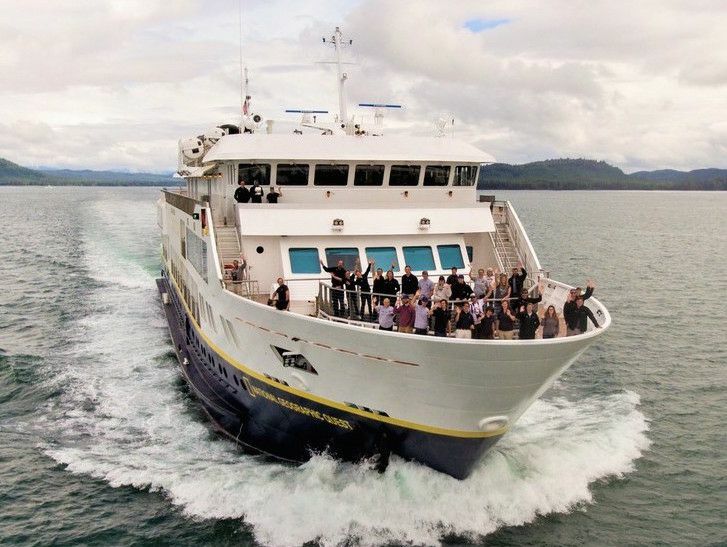 It's an exciting time generally for expedition and adventure cruising around the world and it's great to see a pioneering brand like Lindblad preparing for the onslaught by strengthening their core values and not succumbing to flashy distractions.